on May 17, 2016 at 9:27 pm Hill No! The Motto of Sanders Voters: “Socialism is fun so long as someone else is paying for it” - Hill No! You didn’t adjust for the portion of the interest spending that occurred during Obama’s tenure, as a result of Obama’s borrowing. I would expect that the borrowing done in the end of Bush’s term would not be apportioned to Obama, however, Obama IS responsible for the borrowing and subsequent interest. I’m no economist. Not even a dab hand at budgeting, however, I do recognize profligate spending and excessive borrowing to support it. I also am aware that much of the borrowing during Obama’s term was not long term, 30 year, rather a significant portion was short term. Dan, you say that “most analysts also would remove interest spending from the calculations since Presidents presumably shouldn’t be held responsible for servicing the debt incurred by their predecessors.” Hmmm. “Mr President, this budget is dead on arrival.” And so began President Reagan’s budget deficits as Tip ONeil spent the dividends of Reagan’s pro-growth tax cut and more. 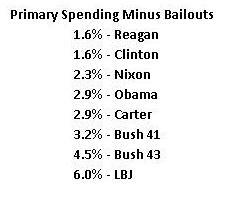 But Mr. Reagan will always associated with deficits that are not his. President Clinton was convinced by others to sign Mr. Gingrich’s budget against his own wishes. Clinton will forever be associated with the balanced budget crafted by Gingrich’s Congress. It is still to be seen whether Mr. Obama will be saved from himself by the Republican Congress and bolster the myth of Liberal economic growth and Conservative profligacy. P.S. I’m often ridiculed when I suggest that in a hundred years (that is really a long time in human progress) it is more likely than not that human life expectancy will double. But as you can see below, it is already in the horizon. And who can possibly have the foresight of a 100 year horizon. Nobody. The world our descendants will live in four generations from now will be fantastic and incredibly wealthy beyond our current myopic imagination. … but I’m told by the public that I have to feel sorry for them far descendants, living way past a century and being five or perhaps ten times richer than we are, with access to things unobtainable today at any price. Why? Because my greed will leave them with a world 2C warmer of course. I wish I could share the optimism. More than current spending Obama is setting the irreversible stage for future spending (to support the mediocre) and less revenue (by burdening the exceptional). In a nutshell, his policies embody a generalized plan to flatten the effort-reward curves. An additional 5% of the American population has dropped off the active workforce and his policies are aimed at helping them feel ever more comfortable without work. Many more will go home or produce with decreased urgency and enthusiasm as indolence is made a bit more comfortable and exceptionalism more taxing. America will no longer be able to compete with the rest of the world and come out a winner. That is the threshold that is about to be crossed – likely has already been crossed and we are now living the short years of momentum. It is not a coincidence that the traditionally strong 4-5% economic growth quarters that typically follow recessions are now anemic 2-2.5% peaks. Fooled by HopNChange the majority of the public sees the 2% growth as the long awaited exit from crisis. The public fails to see that these are all manifestations of an overall permanently and irreversibly depressed growth trend line. Redistribution provides limited temporary relief. The lower growth it causes, compounds and burdens the human growth trendline forever. Had the industrial revolution started in the 1600s as opposed to the 1800s (ie. had capitalism commenced two centuries earlier) we would already be living in a fantastic world, free of cancer and other currently incurable diseases, we would be ten times wealthier per capita, and we would most likely be living over one hundred twenty years, or more, surrounded by things we now cannot even imagine or obtain at any price. Oh but yes, darn, the world would likely be 2C warmer already, so scratch that, we would not be able to live with that, lets go back to our short lived and much-much poorer lives. Thank heavens the industrial revolution and capitalism did not gain a foothold earlier. Let’s go for chemotherapy instead. It’s like slowly pushing on the accelerator of your car, watching the gas consumption go up and up, till the pedal all the way to the floor. Then you switch feet without letting off and claim that the new foot hasn’t increased the amount of fuel consumption near as much as the first foot even though it’s used way more fuel over all by holding steady at full throttle. Your are talking about the rate of increase. The percentage of overall increase in spending means squat when your holding steady at peak output. By stepping in at the peak of Bush II spending, Obama can at once lay claim to a slow rate of federal spending growth during his administration or even to reducing the deficit, while at the same time he has presided over far higher total spending and record total debt. I kept thinking about the OECD wanting to prevent you from hyping tax havens. Feed the beast even if it destroys us all is the stage we are now at.